April Young Bennett needed to renew her temple recommend. Her brother was soon to be married in a Mormon temple and she wanted to be there. “Once you have some feeling for the value of temple blessings and for the sacredness of the ordinances performed in the temple, you would be hesitant to question the high standards set by the Lord for entrance into the holy temple. So Ms. Bennett had the necessary interview with her bishop, who found her worthy to enter the temple. Ms. Bennett went on to the next step — an interview with her stake president. And this is when the wheels came off the bus. Ms. Bennett’s stake president, who had “the responsibility of representing the Lord in interviewing” her (ibid. ), would not sign her temple recommend. Ms. Bennett expressed her hope that Church leadership will one day “respond to the sincere pleas of women with genuine concern, welcoming women’s ideas, requests and suggestions as valuable to the kingdom of God on earth.” She stated that she knows Jesus Christ “does not look upon women who express their desires to participate in his work as nuisances or threats,” yet her stake president, in his ordained capacity of “representing the Lord,” seemed to think otherwise. What strikes me about Ms. Bennett’s experience is the idea of temple worthiness. This is what a temple recommend interview is about, after all, determining someone’s worthiness to enter into and participate in Mormon temple activities “with the Lord’s approval.” Ms. Bennett was deemed not worthy as a vocal author, advocate, and Ordain Women board member. But as a silent supporter of these same ideals, as a silent supporter of the goals of Ordain Women, her stake president says she is temple worthy. It’s interesting to me that temple worthiness has everything to do with outward behavior and nothing to do with the condition of a person’s heart. Ms. Bennett’s experience has brought people to thoughts of “public punishment,” “emotional blackmail,” and an “outward behavior” focus of Mormon temple worthiness. What do you think of when you read of Ms. Bennett’s experience? This entry was posted in LDS Church, Mormon Culture, Mormon Temple, Worthiness and tagged Church of Jesus Christ of Latter-day Saints, LDS Temples, Mormon Temples, Temple Recommend, Worthiness. Bookmark the permalink. I agree with you. It never says that God lived in the temple. The passage you posted in Exodus says that God would descend into the area where the arc of the covenant was. I guarantee God has never entered into the LDS Temples. Why would he? There is a reason why the Jewish people have not rebuilt the third temple yet. There are specific items that are needed in order to complete it and it has to be built in a certain place to the specifications that God gave when he told them how to build the temple. The LDS Temples are built everywhere and in all different styles. None of them are a restoration of the temple God commanded to be built. Its all a fake. Once again you malign Mormonism while ignoring your own heresy. You claim to observe Passover yet you have no Temple. You reject that Christ is the Temple and the fulfillment of the entire sacraficial system. You are just a heretic in a different direction. Wow you have certainly painted a target on my back havent you. I didnt say anything about observing passover or JC. I was just pointing out that the LDS temple is in no way similar to the temple described in scripture. Why do you insist on bringing it back to focus on my beliefs? CattyJane, I’ll reiterate what I said earlier. “MRM is primarily a Christian ministry. Period. It has its own special niche of targeting the LDS. That’s secondary, but by no stretch insignificant. You stand opposed to Christianity by rejecting the core of mere Christianity by opposing the true Christ and preaching a religion of works. You, my dear, do not gather with us. You scatter what we build here. Do you honestly not see this? You want so bad for us to embrace you as Christian, just like the LDS. Then after we embrace you both, then what? You both tear the flock apart. I stand by what I said. You also said you are only here to destroy Mormonism, in so many words. Well, I am not. Could you imagine, I mean seriously imagine, Bill and Eric debating with Mormons and never discussing the true Christ? For them to only disprove Mormonism because Mormonism is a bad thing? That’s absurd! MC is targeted to the lost, and you are just as lost as the LDS. Pointing out the flaws of Mormonism don’t excuse you from this. It’s interesting that Mormons have to be worthy to enter their temples and do rituals in order to become, they wrongly presume, gods. As a Christian I didn’t have to do any “works” in order to become a temple and have the Holy Spirit indwell me. Man are Mormons missing out. Who would sacrifice being a temple? And as to what I did to deserve this honor of being a temple with the Spirit of God in me, I did nothing; absolutely nothing. There was no work I could have performed or moral code I could have kept in order to become worthy. This thing that God does for us goes beyond our understanding. We come to the Lord in faith as He extends His grace to us. Our spirits are regenerated by His Spirit and He comes to live in us. That is the seal of approval. It isn’t some work or moral imperative. Just think of the premium that God places on faith that He made it the sole requirement for salvation. Because I have the Spirit of God living in me, I want to live a life that is pleasing to Him. But it all starts with and is maintained by faith. Salvation is given to us on the basis of our faith in the Lord Jesus Christ. None of us are worthy to enter into a relationship with him regardless of how moral we suppose we are. Our salvation is not maintained by works. We entered into a covenant relationship with God through faith and that is how the relationship and covenant are maintained. Coming to Christ in faith, we don’t seek to justify ourselves as we go forward with works or commandment keeping. Now, someone who comes to Christ in faith walks by the Spirit and in so doing leads a life that is pleasing to God. Ok lets get something straight here. I am not Eric or Bill. I am also not an employee of MRM. This is a public forum for Christians, LDS and ex LDS. If you want the forum to be for only ex LDS who have converted to Christianity than maybe you should make that suggestion to one of the owners. I am also not lost and you claim that I am. I don’t discuss some topics because I haven’t completely decided what to believe on those issues. I won’t argue for or against the things that I don’t understand. However there are things that I am very sure about and that I know helped me to see why the LDS church is a completely made up religion. If anything the LDS who read this blog have more of a reason to trust me than they do you. I don’t have an agenda. I am not trying to convert them to anything. I am just trying to show them how much time they are wasting with there pretend temple and religion. You say that it doesn’t matter if they simply leave the church without converting to Christianity. Why would you say that? They are living a fake life based on some guys revelation from the inside of his hat! Would you say the same thing about the women who leave the FLDS church and were caught in an abusive polygamist marriage? I hope that you are not that narrow minded. Many women stay in an abusive marriage simply because they believe their husband has to call their name in order to reach the celestial kingdom. If they could see how that was not true and leave the church than how can that be failure? Regardless if they convert to Christianity or not I would see that as a success. False religions are nothing more than spiritual abuse on the family. Its sad and I have a friend whose husband has cheated on her with multiple women but she stays with him because of the things she believes about this faith. She thinks if they just make another trip to the temple as a family than somehow it will fix things. Its sick. So I don’t have an agenda to deny Christianity on this site. I don’t have an agenda to convert anyone to another faith. If someone comes out from under the boot hill of the LDS faith because they did a little research on something that I mentioned and saw how many lies they were basing their life on that they don’t have to, then I see that as a success. There are a couple million people who are happy in the LDS religion. If they aren’t going to come to Christ in faith than they may as well stay in the Maze. What difference does it make? They’re lost either way but at least the LDS church provides some structure and moral training. Although, I must admit that there are countless former Mormons who are now atheists who seem to also lead a moral life and are happy to be done with the false religious system of Mormonism. Frankly I can’t blame them. My purpose in being here is not to get someone to leave the LDS faith, although that’s a natural consequence of a Mormon coming to Christ. Yes, I’m very interested in “converting” you. But I’m not at all interested in you joining any particular denomination of Christianity. In fact I don’t care if you don’t join one. What I’m interested in is you coming to the point in your spiritual life where you recognize that Jesus is God incarnate, the Lamb of God. Those of us who have been born again by the Spirit of God as a result of our faith in Jesus have a responsibility to bring the Word to those who do not know Him. I won’t apologize for that nor will the other Christians that post here. So if you stick around here you are going to get a steady diet of Jesus and the Good News of redemption through faith in Him. The only group I’m really interested in being in is the Mystical Body of Christ made up of all those who are trusting totally in Him for their salvation and not putting any confidence in the flesh. The temple cannot be built today because of the land. All the other requirements have been met. They have all the vessels, people (Kohanim with proper lineal descent – the true Levitical priesthood). The God of the Old Testament leads David towards a promise of an unbreakable lineage as contrasted with a house that hasn’t been built for himself. 1. This proves that the Aaronic or Levitical priesthood is not transferable (contrary to LDS understanding). Mitzpe Yericho is the place where they are constructing a real size duplicate of the Temple to practice and teach priests and Levites the rituals. Temple objects are already prepped. 3. When the Messiah comes, there will be no need for the temple, because He is the temple. Would God build a temple knowing that it would be demolished as a place for Himself to dwell in? 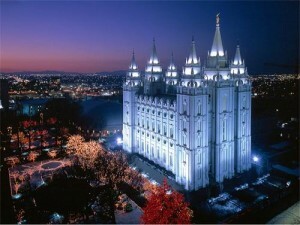 Doesn’t it make sense that He would be the temple, because He cannot be demolished? “The Lord your God will raise up for you a prophet like me from among you, from your brothers—it is to him you shall listen—just as you desired of the Lord your God at Horeb on the day of the assembly, when you said, ‘Let me not hear again the voice of the Lord my God or see this great fire any more, lest I die.’ And the Lord said to me, ‘They are right in what they have spoken. I will raise up for them a prophet like you from among their brothers. And I will put my words in his mouth, and he shall speak to them all that I command him. And whoever will not listen to my words that he shall speak in my name, I myself will require it of him. Herod’s second temple was nowhere near Solomon’s temple in splendor, therefore, it must be talking about either the millennial temple or the Messiah as the temple. If it’s the Millennial temple, then no one in this era can experience God unless the temple is around. Death will precede the ‘true’ religion of the OT. Therefore, Jesus must be God’s temple. Jesus is the embodiment, the person of God, who has now made his temple available for all flesh (read people) to access through his work(death and resurrection). There’s no need for an earthly, physical temple. You tell us about all of the studying you are doing and it makes me wonder if any of it has anything to do with the only really important subject, “Who is Jesus?”. All of your study, if it doesn’t bring you to a personal knowledge and relationship with Jesus, who was God incarnate, then your efforts are worthless. You will remain dead in your sins despite your efforts at commandment keeping. Commandment keeping puts you in the category of the “moral” person that Paul writes about in the first three chapters of Romans. You certainly aren’t without knowledge regarding who Jesus is and what God’s plan of salvation entails as it has been presented to you continually for the last several months. Whether or not you are willing to respond to God’s grace and receive, through faith, the gift of eternal life the Father is offering you is a whole other thing. As I said in an earlier post, if your goal is to provide Mormons with information that will bring them out of Mormonism, what’s the point? If you don’t know Jesus as Savior and as Lord, what do you have to offer them? Nothing really. Just a lot of heartache without a solution to their main problem which is being declared righteous and worthy through faith in Jesus. I would have been happy to stay in the LDS religion as well. I was excited at the idea of my child being baptized by the Priesthood. I couldn’t wait for that day! When I found out that it was all a lie I didn’t have any interest in it anymore. I didn’t see the point. When it comes to the NT I don’t know what to believe right now so I just stick with what I know is true out of the bible. If I don’t know, than I don’t make a judgement either way with what other people decide to believe about it. I just try to do what is right with the knowledge and understanding of the scriptures that I have right now. I wouldn’t say that I am atheist because I do believe in the God of Israel but I also can’t call myself a Christian because I don’t believe the same things that you claim Christians have to believe. At this time I don’t have a title to how I believe. I think the best thing I can say is that I am seeking for understanding. Maybe once I have that then I can make a better educated decision about what faith to choose. Catty, what’s holding you back? Thanks for being honest . I’m glad that you’re reading the Bible . You’ve discovered some of the truths that it reveals and have shared them here . Great . You said that you believed in ” the God of Israel ” . So do I . He’s the Creator of heaven and earth . Jer. 10:10 ; 29:12-14 ; Isa 43:10-11 ; 45:23 . Don’t stop. If I remember correctly you said that you consider that Jesus is the Messiah . You’re on the right track , keep going with that to see if it leads anywhere . Like falcon mentioned you’re going to hear a lot about Jesus on this blog . You seem ok with that and understand that we believe that the ultimate victory of those who leave the Mormon church is to find their heart longings met when they ask the Lord Jesus to be their Savior . We want LDS to know that it’s all about Jesus , not a church organization , fraternity, self help class , or such . That may not compute to many LDS , or to those who leave the Mormon church , but it is what they need to know. They can meet Jesus free of any religious trappings and allow Him to make Himself real to them . I’m talking about way more than following Him as a example on how to live their life , and more than a way shower . Look at John and Paul , for instance , and see what they found out all this . I appreciate your candor and willingness to share your journey and current status with us. It’s a very fine-line for those of us who are Christians, especially those engaged in Christian apologetics, to walk. We need to respect where people are at right now because most of us have experienced the journey of faith. We didn’t arrive where we are suddenly and fully formed. However the very nature of what we do demands that we give a vigorous defense of the faith. I am trying to follow through with learning more about Jesus and the NT. There is a huge part of me that wants to push the NT away for fear of it being an addition just like the BOM. I finally decided this week that I just need to read the whole thing for myself. Ive read a lot of it just from doing research but I haven’t read the whole thing. I understand those of you on here who are actual apologists. My first encounter with any apologetic site was this site. I remember Jaxi and Falcon ripping me to shreds. It was horrible. Over the last two years I have listened to many apologists for and against the NT. I know both sides of the argument very well. I have a lot of information to sift through. Sorry if I caused you some pain. By reading and studying the NT you will at the very least come to an understanding of what it’s all about. I am a theological minimalist in that I don’t get too far into the weeds on a lot of things. It’s not that I don’t know the different theological perspectives, but like the Apostle Paul wrote, my purpose is to know Christ and Him crucified. That’s why I’m always banging away at the topic of “Who is Jesus?”. Jesus is a stumbling block for some and a stepping stone for others. That’s an interesting take on the NT. That’s really the revelation of Jesus Christ. So if that’s rejected then it’s back to the OT and the Law. Its not a big deal. You guys made me mad and it forced me to research things. I realize that for many understanding every bit is not important to them. For me it is. I understand that for you to say if the NT is not true than its back to the law it seems like a big deal. Really it isn’t a big deal, temple or not. But that gets into a whole discussion about sacrifice and different types of sacrifice and how did the people receive forgiveness while in Babylon or Egypt when they couldn’t give sacrifices. How did Daniel receive forgiveness. I realize this is not the place for all that so I wont go into it. Debunking the Mormon temple feels like playing cards with my brothers kids from where I am sitting. Its understanding the crossover from OT to NT that I am having issues with. I can see a lot of passages in the NT that mirror perfectly with the OT and I have many reasons to believe that JC was the Messiah but I’m having a hard time accepting him being God. I am also not sure about the Resurrection part of it but Im not saying that Im casting out the idea. I know there will be a temple in the world to come because scripture does talk about offerings being giving in that day. The third temple will be built by God himself and will be a temple that will not be destroyed. As far as the passage in Duet I am not sure if that is speaking of one prophet or of the line of prophets that came after Moses. I have heard both interpretations of that. So there we have it. I don’t know if I can be of much help to you in your quest concerning whether Jesus was God incarnate, was He resurrected from the dead and is the NT a revelation of Jesus or is it simply additional scripture like the BoM. Now the reason I say that I don’t know if I can be of much help is because this appears to be something that you have to fly solo on. I always figure the Holy Spirit will lead folks where they need to go but I guess in the final analysis you’re going to have to answer those basic questions you have for yourself. It makes no sense that Deut. 18:18 prophesies that God will raise up a prophet just like me (word for word) [כָּמֹ֔נִי] [just like me according to Moses], when in the conclusion of Deuteronomy it explicitly discusses the non-fulfillment of that prophecy by any prophet. Unless, of course it’s solely Messanic. Only the Messiah would be God incarnate, and able to exceed Moses, and be like Moses yet be outside the boundaries of the prophecy, simply because He was God. It really makes no other sense, otherwise you have a contradistinction that Jewish commentators find impossible to reconcile. Only Jesus, the Messiah has exceeded Moses in his communication of the Word of God to human flesh. This is because he is the Word, or the revelation of who God is. catty, I’m glad to hear you say that you will read through the New Testament . You might consider taking a break from this blog for a month and read and re read the New Testament . Give yourself time to see what it says . Read it through , then start again and when a verse mentions Jesus read it several times slowly in context to see what it says about Him . Is He just another Rabbi ? Is He another prophet in a long line of prophets ? Is He the Messiah/savior ? Just what does the N.T. reveal about Him ? Do this for you . I pray that God will bless your time . I’ve told you my story so you should understand I was in a similar one to what you are in now. Was the NT just an addition to the OT as the BoM was to the NT? The Trinity? That just doesn’t even make sense to me or even to Christians. I moved from Jesus being just a man to being semi-divine-ish. I moved from being a universalist to being a person who followed the Jewishness of the NT while rejecting the core doctrines of “Christian misunderstandings” of the NT. I moved away from the deity of Christ and more to the Mosaic life. But you already know this about me from what I’ve said in the past. But before all this I was a Christian, so what happened? The Book of Mormon, it threw me off pretty hard. Now, what snapped me out of it? People have dropped the hard facts and rebuked me in the past, but one person in particular, a person who I admired greatly, challenged me, and challenged me hard. That started it, but then I got the godsmack and God finally got my attention. I can assure you that I do not wish that on anyone. The thing is, that was only a temporal godsmack, but consider how many other people will only ever receive the Eternal Godsmack, and for them it will be too late. So when I say it breaks my heart believe me, it really does. Is there anything that I can say to you to change your mind? Probably not. But what else can I do? I used to look down on Christians, but at the time if you would have asked me and I would have said, “No, I don’t look down on Christians. They have their own relationship with God of Israel. It may not be right but that’s for them.” but in reality, I looked down on them as foolish, when in reality I was the fool. I was living in darkness, but while I was in it I would have sworn that I was walking in the light, yet it was actually so dark that I was blind. The truth is that there is a Mere Christianity that connects all branches of Christianity. C.S. Lewis was an Anglo-Catholic (Roman leaning) Anglican priest who had begun working and studying very closely with the Eastern Orthodox. It’s in that context that he wrote “Mere Christianity.” R.Catholics claim him as closet R.Catholic. E.Orthodox claim his as a closet E.Orthodox. Even Protestants claim him to be a closet Protestant. It should be noted that Mormons claim him to be a Mormon, but they have to distort his words and ignore other parts. But for those who take his words at face value, that is Mere Christianity. If you follow a Christianity that sets up a different Jesus from the same Jesus that is believed by all Christians everywhere and a Christianity that returns you to your own works, then you have to by necessity scatter rather than gather with them, and have to oppose them just as they oppose you, regardless of how much you would like to believe that that does not have to be the case. Yes, take some time off. Read the New Testament with no commentary, just read it. Don’t listen to elaborate definitions of key phrases from anyone, just read it. Interesting story. I must have missed some of the details along the way in your posts. What a journey you had. Isn’t it interesting that some of us struggle like crazy coming to Christ and then others just surrender peacefully. I guess we’re all wired differently! If the NT isn’t true and if Jesus isn’t the Messiah I’m in real trouble. There is no hope for me. I’m lost in my sins. I could never get myself straightened out enough to be acceptable to God. Now just so people understand, I’d consider myself a pretty moral guy. But even at that, God’s standard is absolute perfection. Having been raised R. Catholic, I know sin inside and out. All I can say is that I’m continually falling short. There is nothing, save the Blood of Christ, that gives me any hope at all. If you believe that the blood of bulls and goats can take away sins, you will have difficulty understanding how God forgave Daniel. This is because the assumption is that Temple sacrifices are necessary for the atonement of sin. 1. Why did God forgive David without an atonement or offering? Remember the tabernacle exists, shouldn’t there be an offering or atonement before the Holy of Holies or the sacrificial altar? Wait, why were these Ninevites saved without a reference to Israel or circumcision or the law? Is there any mention of offerings or atonement? No Jewish scribe or Rabbi can explain why God can forgive without the law’s so called atonement or offering requirement, unless of course God met the atonement through the only one who alone could atone for our sins, the perfect sacrificial lamb, eternally slain, Christ Jesus before the foundation of the world. God doesn’t set a requirement and then fall short of it. If there is an atonement to be made and offerings that are needed, he meets those requirements, since we cannot.